I can still remember the first time Deer Antler Spray was brought into my horizons. I was still in HIGH SCHOOL at the time when some of the football players started spraying this weird stuff into their mouths. I, of course, was so confused. My girlfriends and I thought they were spraying some sort of breath freshener in there. Now that would’ve been a pleasant surprise! Alas, it was all in an attempt, apparently, to elevate growth hormone, or IGF-1 levels. Now. Whether or not deer antler velvet actually works for that function is neither my focus, nor a consideration of today’s review. What I’m going to do is focus only on Bucked Up as a pre workout supplement. I only care about if Bucked Up works for improving strength and endurance levels. “But Allie, aren’t you afraid this pre workout is like a steroid and will make you get huge and jacked??”. No. I was not worried in the least. Guys. I’m, like, 200% sure that deer antler spray is NOT some kind of steroid. Plus, the customer service at DAS Labs confirmed that women can safely take this pre workout. But now that this concern is out of the way for all of you, let’s TALK ABOUT the actual Bucked Up pre workout. Starting with the performance. Does DAS Bucked Up pre workout work? It’s simple. Pre workouts ‘work’ if they allow you to have a more effective workout than you would without it. So. To distill this down to it’s simplest form- the answer is, yes. I had better workouts with Bucked Up than I would have without it. Now. Most pre workouts do. That’s why we buy them. Lol. But how does Bucked Up perform versus some of our top pre workout supplements? Tough to say. I don’t think Bucked Up will crack our top three in 2017, but I think it probably has it’s niche. What makes Bucked Up really good in my opinion is just how pure and clean the energy feels. I don’t know if the deer antler helps with energy, but this pre workout does have a slightly, well, different feel than the others. But not necessarily in a ‘higher stimulant’ way. It’s almost as if there’s a deeper source of energy being released by Bucked Up. I know, I know. It sounds a little fluffy. Kind of like all the ‘keto’ talk. But. I think if you give Bucked Up a shot yourself, you’ll sort of sense what I’m talking about. It just feels different. Speaking of different, I suppose I should mention the taste. The Bucked Up flavor that I tried was called ‘Blood Raz’, which, I’ll admit, was a little bit nerve wracking. Combine that with the intimidating packaging, and claims of ‘growth hormone’ benefits, and you can imagine that it took a while for me to convince myself to ‘buck up’ and take a scoop. But, while we’re on the topic, DAS Labs does make a stimulant free version of Bucked Up that I think is a little more mild and probably a good entry point for women who have not a ton of familiarity with pre workout supplements. But taste. Taste. Taste. Blood Raz gives me the feeling of, well, cough medicine. I think there’s a pretty good reason why most companies don’t offer a straight up raspberry flavor of pre workout. It’s just hard to get a pure raspberry to taste that great. But hey. You don’t have to apologize for it, DAS Labs. I appreciate that you tried something different. And I actually think with a little bit of tinkering, DAS will be onto something with their pre workout flavoring. Maybe a little bitterness from citrus to balance things out a bit? Raspberry citrus punch? I think that sounds nice. Make it! Lol. Listen to me being all demanding. So to summarize so far- this pre workout gives great, unique energy, and tastes not that great. I think to add a bit more color to the performance…you don’t have that much of a ‘pump’, which was surprising to me since they do have a LOT of citrulline (6g). But then again, I’ve never been a huge citrulline fan. I just haven’t. The endurance is OK, but nothing special. So performance is getting an 8.4 out of ten, and the same with taste. Ok so here’s probably my favorite part of Bucked Up- the formula. And I think now that I’ve taken a more careful look, I’ll probably end up having better workouts because now my BRAIN will tell me that the PRODUCT is actually more powerful and well made than I initially experienced. I particularly want to call your attention to the branded ingredients in here. AlphaSize is used in some of the world’s most popular pre workouts, and including probably the most popular pre workout of all- the legendary Pre Jym. Pre Jym is one of my favorite all time workout boosters and the fact that there’s crossover between Bucked Up and Jym is no surprise. The AstraGin and Actigin are also great inclusions in any pre workout because they really help with the uptake of each ingredient so your body can absorb them more completely. I think that’s what helped contribute to the great energy that I had too. So you know from what I said before that I was DEFINITELY a little bit intimidated by Bucked up at the start, and that’s because it just looks sort of intimidating. But really, I have to separate my feminism from my ability to evaluate the products from a design perspective. These products do look good. There’s no denying it. Bucked Up looks GOOD. Black is the perfect way to frame the deer silhouette. Is it a skull or just a bust? I’m not really sure- but it looks fantastic. I think to go even at a higher level, DAS Labs branding in general is awesome. I mean. Everyone loves deer. They represent strength, freedom, and I think that’s a symbol that has very wide appeal. 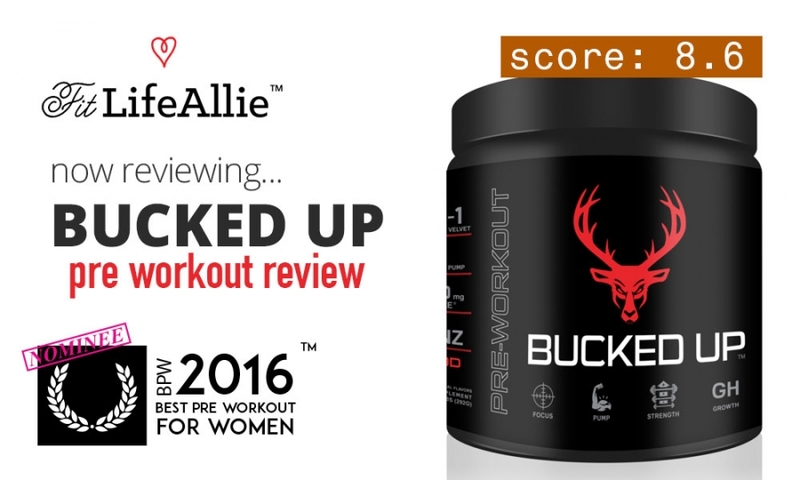 That’s why even as a women who was a little hesitant to take this product because of the black, and the red, and the horns, etc etc, I think Bucked Up pre workout is still a product that resonated with me. And plus, if the black and red isn’t your thing, the stimulant free version is white and has a PINK deer symbol! It’s so pretty. Lol.